Dew R Dye is a World Champ! 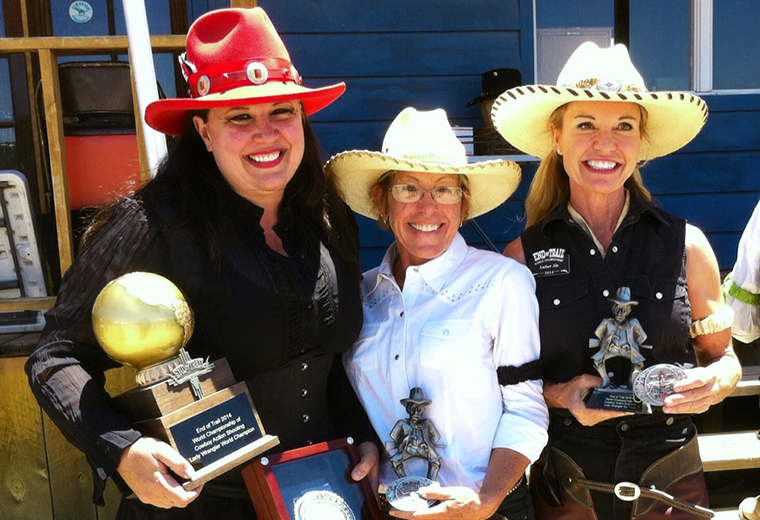 Dew R Dye is the World Champion Lady Wrangler at End of Trail 2014! EOT (End of Trail) was held June 19-29, 2014 in Edgewood, New Mexico. There were over 500 of the best shooters in the world completing for the “World Championship”. There were people there from the United States, England, Australia, New Zealand, Germany, France, you name it and they were there. Memphis Gunslingers has a small group of just over 60 shooters and 8 went to EOT to complete. Not many clubs have a World Champion in their club but Memphis Gunslingers do! Dew R Dye won Lady Wrangler for the second time with a heavy field of competitors. Prestidigitator (Tator as we call him) was 3rd in the Cowboy category and 6th place overall out of over 500. The Arizona Ranger came very close to be our second “World Champion” as he finished 2nd in the Cattle Baron category. Cherokee Sgt. was 7th place in Silver Senior Duelist and his son Mr. Black was 7th in Junior Boy. Cherokee Sgt., is also the husband of Dew R Dye. Bill Carson the father of Prestidigitator finished in 9th place in Frontier Cartridge Duelist. We had three clean shooters on all 12 stages at EOT and they were Cherokee Sgt., The Arizona Ranger, and Hot Lead Lefty. EOT is a great experience and a lot of fun so if you have considered going I would highly recommend it to all Cowboys and Cowgirls.